If you live in a snowy climate, you've undoubtedly heard warnings about how to avoid injury while shoveling snow. But people aren't the only ones to be concerned about with snow removal. Your landscape, too, can suffer damage when the white stuff heads its way. Let's explore how to keep your landscape safe when removing snow. There are two ways to make snow go away: move it or melt it. Mark your property. Most snowplow damage occurs because the driver can't see what to avoid. Before snow accumulates on your property, mark the edges of driveways, beds, lawn, etc. with sticks or light-reflecting poles. If someone else will be doing the plowing, be sure they are aware of the markers. Plant trees and beds far enough away from pavement to avoid risk of damage. Clear snow as soon as possible while it's still easy to move. Once it sits, it often hardens up and requires more forceful snow removal efforts – increasing risk of damage to grass and woody growth. Don't pile snow on or against your shrubbery. This can damage branches, lead to excessive salt build up, and stress the plant in spring when it's coming out of dormancy. Avoid piling up snow on your lawn if you can. This is not always possible, but heavy piles of snow will stress the grass and make it susceptible to fungal infection. If you must pile snow on your lawn, try to break up and spread out the snow on sunny days in the spring to encourage faster melting. Use a snow blower to direct snow to appropriate areas of your property. Snow blowers are also less likely to damage grass and hardscape than a plow blade. If a snow plow blade rips up big chunks of sod, put them back in place as best you can and as soon as you can. 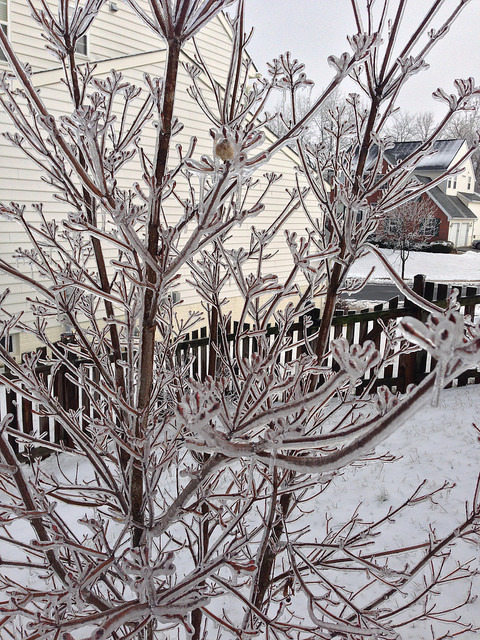 Try not to handle ice-encased branches. They're brittle and can be easily damaged. Wait until ice melts to inspect for damage, then prune broken branches carefully and right away to prevent further damage from wind catching the broken limbs. To prevent paver damage on large parking areas, plazas and other large spaces paved with masonry, hire a snow removal contractor willing to equip their plow with a rubber or urethane blade or use a skidsteer or truck with a rotating broom. A large push broom can be an extremely effective tool for safely removing snow from smaller areas of brick pavers such as walkways and masonry patios. You'll want to use it while the snow is still fresh and loose for best results. Keep vehicles off your lawn. Even when the ground is frozen, the weight of a car, truck, or RV can damage your grass. In some instances, it makes more sense to melt snow away by using chemical de-icers. De-icing chemicals work by lowering the freezing temperature of water. In other words, they make ice and snow melt even when it's still cold out. They are especially handy for preventing slip injuries on walkways, steps, patios and other landscape features. The most common de-icer is rock salt, or sodium chloride. Salt is inexpensive and effective for melting ice and snow, but it comes at a cost. Salt-laden runoff can do serious damage to soil and plant roots and can sicken or even kill your plants and trees. The salty spray kicked up by cars can also damage the leaf and flower buds of roadside trees and shrubs. Salt washes into ground and surface water, where it harms the environment. It can damage concrete and masonry by increasing the frequency of the freeze/thaw effect. And, it leaves unsightly white residue both on your landscape and on your shoes and boots, and can make your floors a mess when it gets tracked inside. Avoid planting sensitive plants where there is likely to be salt exposure: near roadways, sidewalks, etc. Annuals might be your best bet in these areas. Use alternatives to rock salt such as potassium chloride, magnesium chloride, calcium chloride, and acetate compounds. While technically salts, they are generally far less harmful to plants and the environment. Follow directions on the product label to avoid overuse of product. Cut salts with sand or kitty litter to provide traction and reduce the amount of de-icer needed. You may find a good layer of sand is all you need. Remove as much snow and ice as possible with a shovel before applying salts. This will keep your need for de-icers to a minimum, and help them work more effectively. Finally, let's circle back to you! As important as your landscape is, it's even more important to keep yourself and your loved ones safe. Be sure to use best practices while shoveling and other snow removal activities: keep your back straight and shovel with your arms and legs, not your back; follow proper safety precautions when operating snow removal machinery; and work at a moderate pace to avoid over stressing your heart. Of course, there's nothing saying you have to do all the snow removal yourself. Many landscape professionals in snowy climates offer snow removal services throughout the winter months. Hiring such an expert to do the job is an easy way to keep both you and your landscape safe and sound all winter long!